Skate 4 Release Date Leak Was a Fake, You Guys | Nerd Much? If you’re like us, you’ve been beating down EA’s door with requests for a Skate 4. 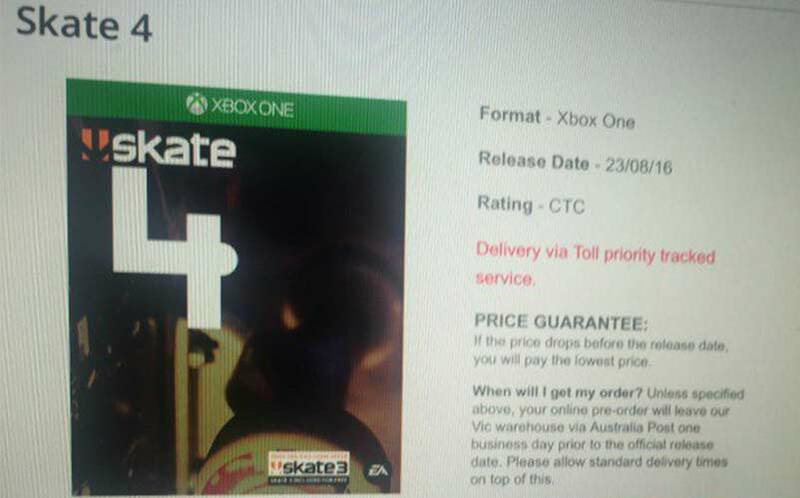 Now, we’ve received our first signs that Electronic Arts might actually be listening to its community of skateboarding game-lovers, as a listing for Skate 4 on Xbox One version appeared on JB Hi-Fi, a mega Australian retailer. The listing, which included a release date of August 23, 2016, was quickly removed, but a Redditor snapped a photo of it beforehand, which you see here (hat tip to PixelDynamo for the find). Sure, we’re going to take this with a grain of salt, as it’s far from an official announcement. However, there are some other recent happenings that make this super believable. For one, the fact that the box has the trusty ole’ “Includes a Digital Copy of Skate 3″ sticker on the bottom of it, which falls in line with the fact that Microsoft told fans late last year that we would be seeing Skate 3 backwards compatibility soon, and it oddly hasn’t happened yet. And, there’s no word from Microsoft or EA on when exactly we should expect Skate 3 on our Xbox Ones. It’s likely that the Skate 3 bc is being held back for the release of Skate 4 on Xbox One, so that EA can pair it with the new title. We don’t know what this could potentially mean for PS4 gamers, as we haven’t seen any Skate 4 PS4 box art or heard any mention of a PlayStation 4 version. However, it’s doubtful that EA would make Skate 4 Xbox One exclusive. And, we don’t even know that this is happening for sure yet. It’s likely that EA could save the big announcement for E3 2016. We’ll see what happens, but if we had to put a percentage on the probability that Skate 4 is indeed coming in August, I’d put it at a solid 80%. For now, readers should check out our Skate 4 wishlist.